Max Pechstein (1881-1955) was one of the most prominent artists of German Expressionism. Hailed by some contemporaries as the leading member of the Brücke group, Pechstein played a central role in the German Avantgarde during the first decades of the twentieth century. He was the best-selling member of Brücke and a decisive catalyst for the group’s development. Throughout his time, his art caused controversy. Yet Pechstein did more than paint, he was also an important player in the world of art politics. One of the founders of the revolutionary November Group, Pechstein became a hate figure for the extreme Right, and was included in the infamous ‘Degenerate Art’ exhibition of 1937. Some National Socialists, however, also valued his work and Pechstein was allowed to continue working throughout the Third Reich. In the post-war period, he was showered with honours, and simultaneously attacked by proponents of Socialist Realism in the East and Abstraction in the West. Max Pechstein, Exhibition Poster for the Brücke show at gallery Richter, Dresden, 1909. 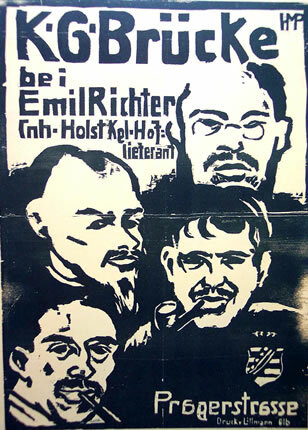 With portraits of himself (bottom left, Heckel (left), Kirchner (bottom, right) and Schmidt-Rottluff (top right). Wooduct.